Fluorescence imaging is a non-invasive technique, which enables you to visualise and to quantify the effects of agrochemicals and pathogens on the photosynthesis. Fluorescence imaging is an outstanding tool for demonstrating the effects of formulation, adjuvants and application technology on the performance of agrochemicals. The offered applications of fluorescence technology have been developed by Plant Research International and SURfaPLUS in Wageningen. Interested in a possible project, please contact Hans de Ruiter. If a pesticide or pathogen reduces the efficiency of the photosynthesis, the fluorescence of the chlorophyll increases because less light is used for the photosynthesis. The new facility in Wageningen quantifies and visualises the changes in fluorescence over the whole plant and over leaf areas up to a spatial resolution of 10 µm. 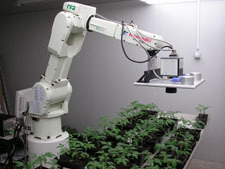 By using a robotised system, fluorescence of hundreds of plants can measured at different time points. As a result, we can provide you the dynamics of changes in fluorescence as a movie or accurate data. Both for science, screening and marketing purposes, these movies or individual pictures proved to be very effective. See also our publications on fluorecence. The fluorescence facility visualises and quantifies quite well the effect of a surfactant (used as adjuvant to improve the pesticide activity) on the performance of bentazone and glyphosate. To optimise surfactant type and concentration, this fluorescence approach can be applied to monitor what happens in the plant. Phytotoxic effects of surfactants themselves can also be visualised. In addition to the visualization of effects, the technology enables you to quantify formulation effects on the day of treatment (inhibitors photosynthesis and for instance glufosinate) or within 2-3 days (glyphosate). This quantification correlates quite well with growth inhibition. Using a photosynthesis inhibitor with contact action as a a "marker", the influence of spray application factors like water volume, drop size and air-pressure can also be investigated by fluorescence imaging. Visualising and quantifying of pathogen activity and effect of fungicides and insecticides on the pathogen acticity. To check the level of herbicide-resistance of crops and weeds. Plant Research International developed the fluorescencence technology. SURfaPLUS R&D has access to this technolgy for the development and testing of more effective formulations and adjuvants for agrochemicals. See also our publications on fluorescence in the list of publications. Glyphosate activity imaging without (left) and with adjuvant (right) 96 h after treatment. Bentazone activity imaging without (left) and with adjuvant (right) 2 h after treatment. Phytotoxic adjuvant effect in colour (left) and via imaging (right) 48 h after treatment. Bentazone activiy after application with a fine (left) and a coarse nozzle (right) 72 h after treatment; coarse nozzle (XR 8005) is more effective.